The Riddle House, standing in Yesteryear Village in Palm Beach, Florida, is home to a ghost who doesn’t like men. Yesteryear Village is a virtual museum of a late 1900’s era Florida town. There are 30 buildings in the 5-acre village which have either been moved intact from their original historic sites or reconstructed from blueprints. Located at the South Florida Fair ground, the village opens during the Fair in mid-January and visitors can walk through all the buildings. Weird things happen there like the attic light turning on by itself etc. The Riddle House was built in 1905 and is located in Yesteryear Village, Palm Beach County Florida. The Yesteryear village is not its original location; it was originally built in West Palm Beach. The Riddle House was built adjacent to Woodlawn Cemetery. The old cemetery started becoming a host to crimes, like grave robbery. Being adjacent to the cemetery it was then used as ‘Gatekeeper’s Cottage’, where the security in charge of the cemetery lived. During that time a cemetery employee named ‘Buck’ was allegedly killed in an intense argument. Locals would report seeing the ghost of Buck, who seemed to be continuing his work at Woodlawn cemetery. Later in 1920, Karl Riddle, a city manager and supervisor of Woodlawn Cemetery, moved into the haunted house and made it his own private residence. This is when the Riddle House received its name and was no longer known as the Gatekeepers Cottage. During his tenure in the Riddle House, an employee name “Joseph”, encountered financial difficulties. Mentally stressed with all this and having no option, Joseph committed suicide by hanging himself in the attic. After this incident Karl Riddle began witnessing strange incidents. There would be noises of things dragged on the stairs, a shadow of a man was seen through the attic windows and much more. Workers felt some unseen man touching them. Terrified by the happening all the workers left the place and never returned. Finally Karl Riddle and his family had to leave the place. Many people and businesses tried to occupy the building. Everyone faced the same horror. The last ones to occupy the place was Palm Beach Atlantic College in the 1980s’. They used the place as a girl’s dormitory. Then there was no one to occupy the place and eventually the house began deteriorating. It was then decided to demolish the house. John Riddle, nephew of Karl moved the house to Yesteryear Village. He dismantled the place and transported it. The roof and attic were split in two, as was the first and second floors. Finally, the building was moved to Yesteryear Village and was reassembled, where it stands now. While moving and reconstructing the house the workers and the carpenters experienced paranormal activities. Their tools would be moved, the windows would break and someone would hit on their heads with hammer. Terrified by these, the workers had stopped the construction for six months. It is also said that during the unveiling of the house, people witnessed the unexpected presence of a couple dressed in early twentieth century clothes. Later everyone found their pictures in the photos of the original Riddle House. This has prompted numerous paranormal investigations by people wanting to prove that the ghosts of Riddle House are real. 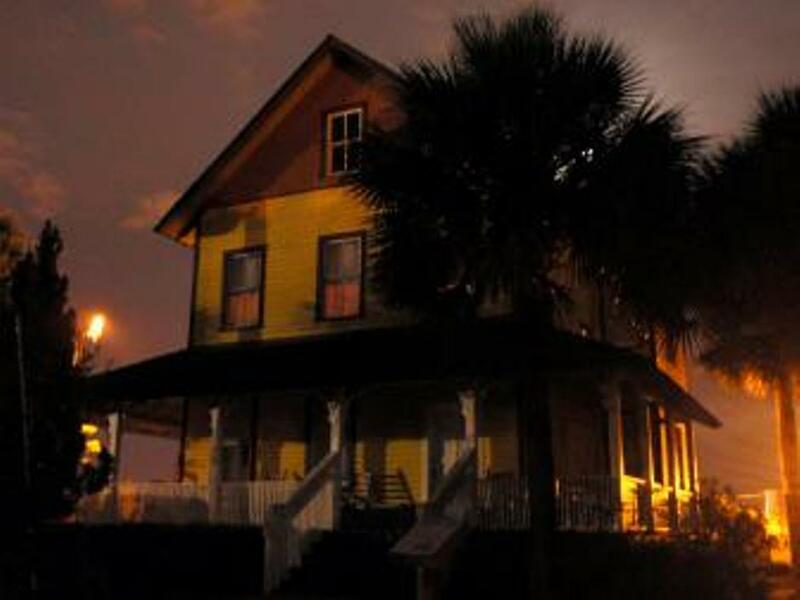 The Riddle House has been the center of investigations, television spots and more since its humble beginnings in 1905 and is undoubtedly one of the most haunted places in Florida.